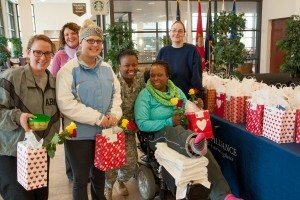 As in years past, Freedom Alliance used the month of February to bestow warmth and regard for military folk in hospitals and treatment centers across the states. It was a message delivered by hand, in true Freedom Alliance style. 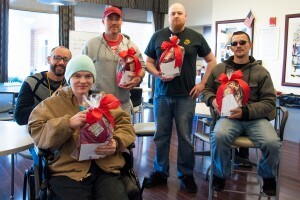 The team began close to home base when we carted hundreds of roses and gifts to Walter Reed National Military Medical Center in Bethesda, Maryland. After setting up our table in the lobby, patients, military staff, and family members gathered around to see. Along with the flowers and notes of encouragement, we distributed boxes of chocolates and the much-sought-after fragrance oils by Lisa Hoffman, which really impressed the women. Many of the male service members were leaving the hospital for the airport or train station, to spend a long Valentine’s-Day weekend with their wives or girlfriends. The men gratefully snatched up our valentines to give to their valentines, saving them the trouble of buying a gift. As well as the roses and gift bags, we brought a very special basket for a very special fellow. 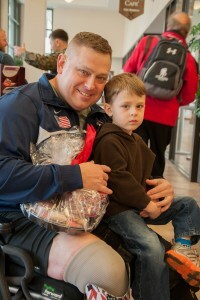 Mark was serving overseas with his Marine Corps battalion in late 2011. While carrying a grenade launcher, he stepped on an explosive, which also caused the grenades to detonate. Due to critical injuries to his lower body, doctors amputated both of Mark’s legs at the hip, ultimately saving his life. Since then, however, he has been at Walter Reed, striving to recover from infections and other challenges, with his mother, Stacy, his caretaker. The Freedom Alliance team came to Mark’s room to personally give him his Valentine Day’s basket, filled with stuffed animals, snacks, chocolates, and—one of Mark’s favorites—strawberries. There were many smiles. We also traveled south to Richmond, Virginia, where we paid a visit to the Polytrauma Transitional Rehabilitation Inpatient Program (PTRIP) at the Hunter Holmes McGuire VA hospital. And we didn’t come empty-handed. These fifteen PTRIP patients are undergoing treatment and therapy for brain injuries and other very serious trauma. 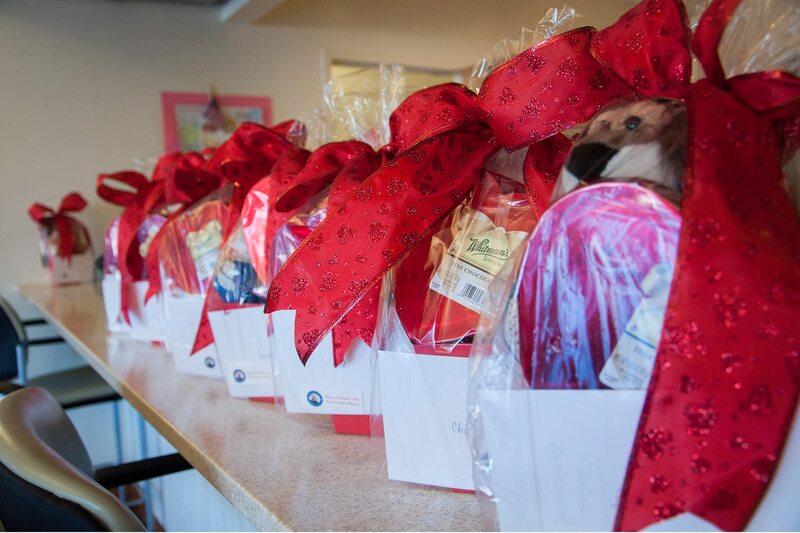 For them, Freedom Alliance assembled colorful valentine gift baskets with chocolates, stuffed animals, and messages of hope. Even the medical staff came out to see and appreciate the gesture. Some of the patients knew us from a troop appreciation dinner we gave in December, and we were pleased to meet the new patients, too. We left promising to organize a white-water rafting trip for them as soon as warmer weather arrives. In another part of the country, Freedom Alliance was active as well. We made a stop at the Fort Carson Warrior Transition Battalion in Colorado, a special unit that supports wounded Army personnel. Here we handed out more Lisa Hoffman Fine Fragrance Oils, 150 total. These gifts were in demand, flying off the table, and service members expressed their appreciation and enthusiasm to share with their loved ones. 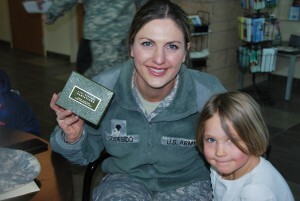 For Freedom Alliance, it seems fitting that we recognize our military heroes on Valentine’s Day. Valentine, the actual man—not the patron or the holiday—lay his life down for love, something we forget when we celebrate. Likewise, our men and women in uniform put their lives on the line for what they believe in—love of country and a responsibility to protect it. This is something we ought not to ever forget. 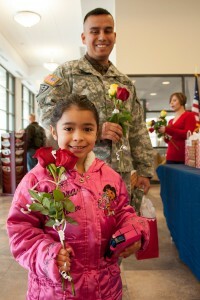 We at Freedom Alliance believe that our armed service members truly are our Valentines.